I have been thinking a lot about Mary Kimsey the past few days. Mary taught the structured learning center program Billy Ray attended for kindergarten through second grade. I can still hear her saying "these kids are not a job to me they are my life" in that first meeting we had. Watching Billy Ray take his tee shirt off the other night I realized at 23 years old he still does that task the way Mary taught him. 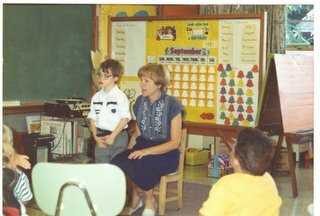 Despite the medication reaction that changed Billy Ray so much later in his life, he has retained much of the wonderful training he received in Mary's classroom. In the picture he is at the front of the class with Mary. Each of the students were called to the board to find their name and repeat their address. This simple activity has had a profound impact on the rest of his life. There have been other teachers in his life who have made a difference. Some of them have already been shared with you in other posts. Chone Fields was Billy Ray's teacher only a part of seventh grade but her creativity has made such a difference not only in Billy Ray's life but also by enabling me to believe things could be better for Billy Ray. The activities she developed for him and her ability to help him feel a real part of the whole school increased his self esteem to a point I didn't know possible. I used a lot of her activities and ideas in trying to restart Billy Ray following seizures he experienced with the medication reaction. I wish I had a picture of them to share with you. Heidi Ostrom had a special relationship with Billy Ray from their first meeting. That is demonstrated in the eye contact in this picture. Billy Ray doesn't favor many people with this intense gaze. Heidi would be the first to tell you the program we created for Billy Ray was not perfect. This is partly because we came to her school district following a traumatic period in his life and he was experiencing multiple health problems the bulk of the time in her program. Due to the struggle that was necessary to create a program for Billy Ray, Heidi and I spent a lot of time together. Now that Billy Ray is out of school I consider her our friend. As friends do we have disagreed from time to time but we have grown by working through those disagreements. Billy Ray is better because of what I have learned working with Heidi. helped me to see that a lot of what we were already doing made a real difference. Dan (pictured playing with Billy Ray) helped me to see that we needed to have fun with Billy Ray and that he could still have relationships with others but needed our help to establish them. 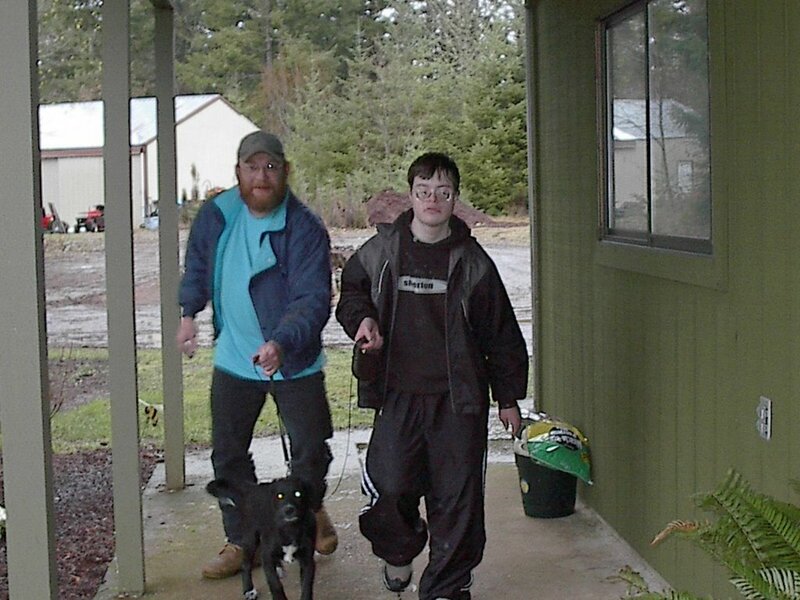 Dan worked with Heidi and me to create relationships with the folks at Silver Falls School District Office where Billy Ray went to do activities several times a week. Some of those folks are still on Billy Ray's mind though we live three hours a way now. We have talked before about Mr. Koger. Every white western shirt and western slacks are still named "Koger" and there is not a day that goes by that we don't hear about "my principal". This two years after he is out of school. There were many people in that school district Billy Ray became very fond of. It would take far too much space to picture and mention all. He still talks of them everyday. My husband, Larry, will shoot me for including this picture but it shows the difference in Billy Ray's life he has made. Being a city girl I have not always enjoyed Larry's need to be out of the city. Billy Ray has bloomed with it. He loved mini farming from the time we met Larry. 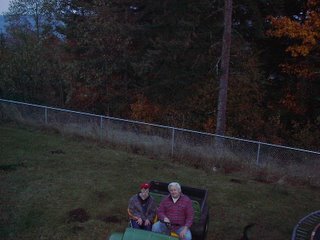 It is a little hard to see from the picture but they are riding in an older John Deere Gator we had in our prior property. Billy Ray loved to go for rides down the back hill and all over the property will Larry. 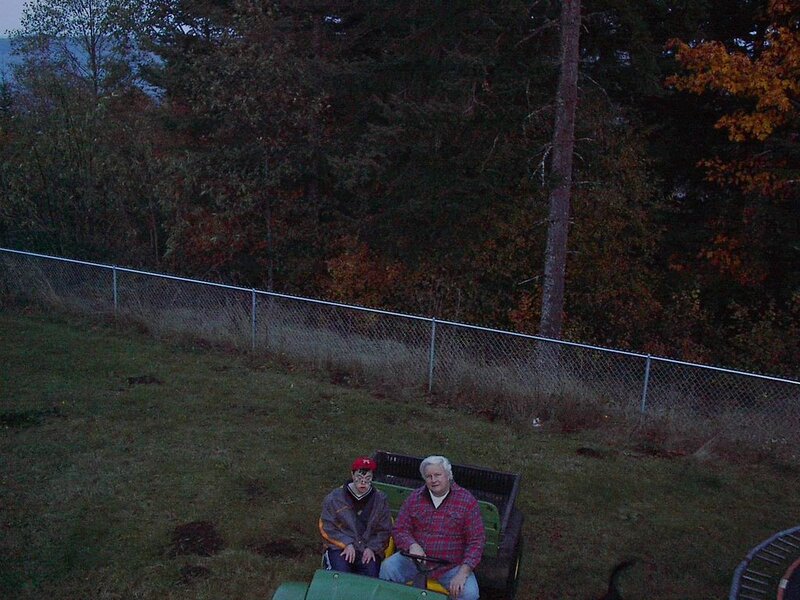 From "Dadgert" Billy Ray learned to appreciate the outdoors and it is special for them to do together. I may prefer to be in city but Billy Ray and his stepfather bloom out of it. Kevin Loyd and Billy Ray had a special bond from the start. Kevin is probably the only employee Billy Ray ever selected himself. Kevin was hired to help with some projects on the property not to work with Billy Ray initially. However, Billy Ray was immediately attracted to his personality and the outside activities. 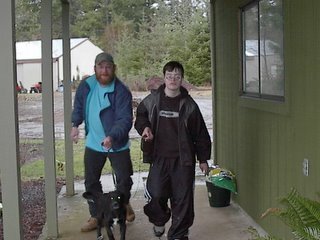 While Billy Ray has had other support staff who have made a difference the relationship with Kevin was unique. I think that it was because like Larry, Kevin is most at home working outdoors. 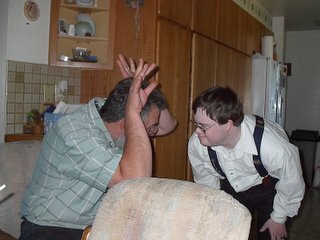 Like Larry his only experience was being a pretty good Dad to his own kids who did not experience special needs. I changed the title of this post to "some" because there is no way I can write about everyone who has made a difference in Billy Ray's life.